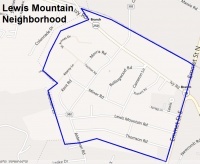 The Lewis Mountain neighborhood is a Charlottesville neighborhood designated by the Department of Neighborhood Development Services. The neighborhood is located in the midst of the University of Virginia. It is located to the east of the University of Virginia's Central Grounds. Much of the land was annexed by the City of Charlottesville in 1938. This page was last edited on 30 May 2012, at 18:08.